Bereket Simon, a former top advisor to Ethiopian Premier Hailemariam Desalegn must be prosecuted for crimes against Ethiopians. This is the view expressed by a Member of the European parliament, Ana Gomes, after news of the Bereket’s resignation was announced on earlier this week. The Portuguese politician who doubles as a Socialist Member of the European parliament also had hard words for the former advisor to Desalegn in charge of Policy Studies and Research Center. She described him as ‘cynical and a cruel totalitarian,’ during dealings with him. She added, ‘(He) Should be tried for his crimes against Ethiopians.’ It is not known the nature of the dealings both had and what crimes she is referring to. 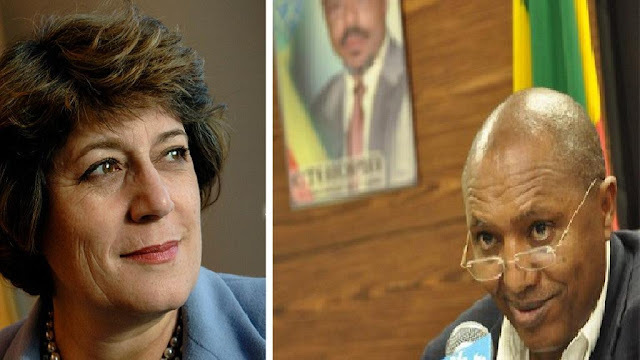 Ana Gomes, currently a member of the political committee of the socialist party, is known to be someone who frequently speaks on Ethiopia’s politics. She was part of efforts calling on the government to disclose charges against Oromo leader Merera Gudina after his arrest last year. The government communications office on Tuesday confirmed receipt of Bereket’s resignation letter to PM Desalegn. It said his letter gave no reasons for his decision but that his request was being considered. He is leaving a post he has held for the past four years. Local media reports indicate that Simon, a veteran politician with his latest resignation had quit two top positions in just a week. He recently gave up his position as board chairman of the government-owned Commercial Bank of Ethiopia. The move comes weeks after two major political shifts around the Prime Minister. The Protocol Chief of the PM, Baye Tadesse Teferi, sought asylum in the United States for fear of political persecution. The Speaker of the House of Representatives, Abadulla Gemeda, also resigned his post following ‘disrespect’ to members of his ethnic group and his party in the ruling party.